25-year-old Qiu Ningyao is one of the few eyewitnesses who saw Li Guochao fell to the ground. At around 9:20am yesterday morning, he was walking on Baoshidong road in Shiyan (Bao'an). He saw that traffic police officers, security officers and emergency teams were inspecting motorcycles. "A motorcycle taxi driver sped away to flee." Qiu Ningyao was speaking about Li Guochao. At the time, Li was in a panic and he dashed forward a few paces before turning around to the opposite side of the street. By the time that he got back to the same place, there was another inspector in the roadway. According to eyewitnesses, this inspector was a neighborhood affairs office worker in uniform. "When this worker saw Li, he could not stop him and so he hit Liu Guochao with his walkie-talkie." 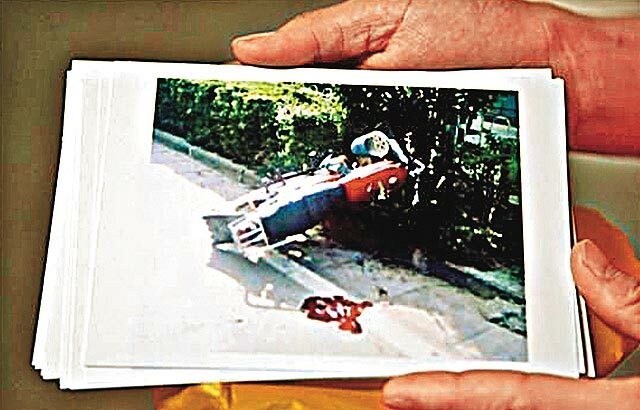 After being hit, Li Guochao continued on his motorcycle for a few more feet before falling to the ground. Yesterday afternoon, the reporter was at the scene and he could still see some bloodstains on the ground. This spot is about 10 meters away from where the checkpoint was. Qiu Ningyao said that Li was lying face up on the ground, and blood was coming out of his nose. When he got over there, Li's body was trembling but unable to speak. The traffic police do not dispute these eyewitness accounts. The emergency ambulance arrived and took Li Guochao to the hospital. The family believed unanimously that Li Guochao died as a result of being hit by the walkie-talkie. When Li Guochao arrived at the hospital, he was first treated at the emergency ward and then send to the Neurology Department. According to a doctor from the Neurology Department who treated Li, the patient had a dilated left pupil, no sign of breathing, a very weak pulse and very low blood pressure. In spite of the rescue efforts, Li Guochao passed away at around 12:30pm. According to this doctor, the patient had an open wound on his forehead. The cause of death was a brain injury that damaged the brain functions. According to the doctor, a neurology specialist from the Bao'an People's Hospital also came to treat this patient, but all efforts were unsuccessful. 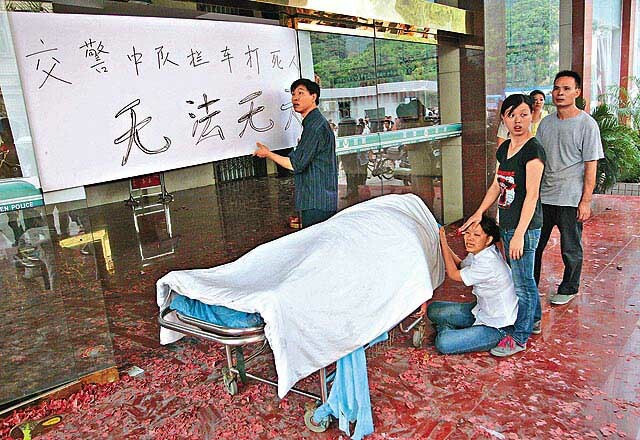 After Li Guochao died, his relatives arrived quickly. According to information, 31-year-old Li Guochao came from Meizhou city, Guangdong province. He and his wife Chen Jinyu came to work in Shenzhen four or five years ago. They have two children in the care of their elders back home. One of them is 7-year-old and the other is 5-year-old. The wife Chen Jinyu said that her husband was a handyman, while she works at an electronics factory in Shiyan. Usually, they only meet once a week. On the day before, Li made some meat with vegetables for her. "At the time, we did not talk a lot." Chen said that she never expected that this would be the last time that they saw each other. Yesterday, Li had already expired when Chen Jinyu got to the hospital. The relatives of Li Guochao said that they did not know what he was doing that morning. A motorcycle taxi driver said that when Li was not busy with handyman assignments, he would work as a motorcycle taxi driver. On that morning, there were inspections in the street. After the incident, several hundred people including family members and taxi drivers went down to the Shiyan Traffic Police Squad office. Many people were gathered in front of the Shiyan Traffic Police Squad office yesterday afternoon. There were signs that firecrackers had been set off earlier. The family of Li Guochao were inside. Several dozen security guards and police officers stood in the lobby. 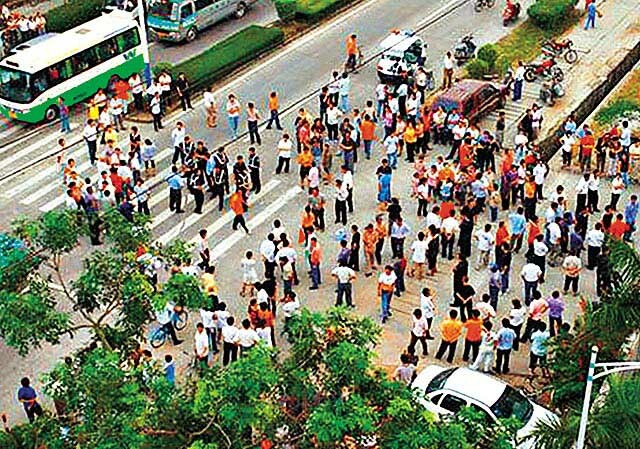 At around 2pm, a crowd began to assemble on the road in front of the Shiyan Traffic Police Squad office, blocking vehicular traffic. At 2:30pm, the family of Li Guochao took his body from the hospital and arrived at the Shiyan Traffic Police Squad office building. They lit up more firecrackers. The body was taken into the lobby, and many of the people gathered outside the building entered into the lobby. At this time, the Traffic Police Squad commander and the other people handling the matter left through the side door. The body was first placed inside an office room, and then taken back out into the loddy. The wife Chen Jinyu knelt down in front of the body and cried. More and more people got inside the building. People were talking to each other. The talk that "the traffic police beat someone to death" began to circulate. A deputy director and a publicity director from the Shiyan neighborhood affairs office showed up, and were immediately surrounded by people. The family declared aloud: "There are only two demands. First, arrest the murderer and disclose the truth. Second, the relevant responsible persons must offer a proposal on how to settle this mater." The deputy director of the Shinyan neighborhood affairs office in charge of traffic said that the police are conducting an investigation and he appealed for people to stay clam. The relevant leader from the Shiyan Traffic Police Squad was also surrounded by people. The Traffic Police Squad leader displayed a document which he claimed to show that the checkpoint action was a joint project with many departments. The reporter learned from this document as well as the relevant leaders that the Bao'an district government had arranged the Shiyan neighborhood affairs office to crack down on the illegal motorcycle taxis by combining many departments such as the neighborhood affairs office, the law enforcement team, the police station, the traffic police and others. The traffic police were aggrieved that they got the blame. The relevant leader said that the traffic police did not stop the motorcycle involved in the incident. But the masses did not understand the truth and came down to the Traffic Police Squad, making it impossible for them to work normally. The crowd also blocked the road so that their vehicles cannot go out to handle traffic accidents. At 3:41pm, several dozen anti-riot police offices arrived at the scene with helmets and shields. Their appearance drew a gasp from the crowd. A window in the Traffic Police Squad office building was broken. The anti-riot police stopped and got into formation by the side door. Everybody went up to them. The family of Li Guochao demanded the Shiyan neighborhood affairs office leaders to remove the anti-riot police. People in the crowd wondered aloud why they were not interested in resolving the matter but called the anti-riot police in instead. The two Shiyan neighborhood affairs office leaders were forced to compromise. The anti-riot police were withdrawn to stay inside a garage, and then outside the front gate of the Traffic Police Squad office. The neighborhood affairs office and the family of the deceased began to negotiate inside an office room. 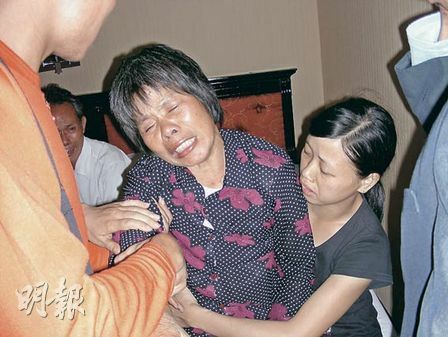 At that time, the wife of Li Guochao was crying in front of the body which as still inside the lobby of the Traffic Police Squad office building. The motorcycle taxi drivers were calmer, but they did not leave. The reporter questioned many of them, and found that a lot of them did not know Li Guochao at all. At 9pm, the reporter learned that the relevant authorities were still negotiating with the family of Li Guochao. Meanwhile, people were still blocking the street. On the morning of November 7, the neighborhood affairs office of the Shiyan street, Bao'an district, Shenzhen city, Guangdong province began a crackdown on illegal commercial vehicles. 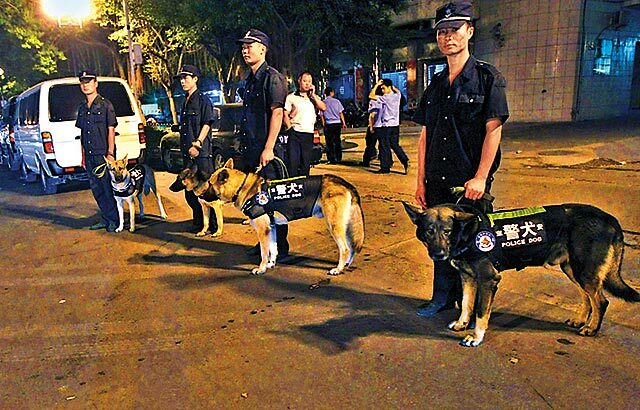 A checkpoint was set up near the Southern Electricity Network Office at Baoshidong Road, Shiyan Street. At about 9:20am, Li Guochao (male, 31 years old, from Meizhou (Guangdong), no valid driver's license) came along on an unlicensed two-wheeled motorcycle with a passenger traveling from west to east. When the inspectors saw the unlicensed motorcycle, they stopped it for inspection. The passenger got off the motorcycle. Suddenly Li Guochao stepped on the gas and sped away from the checkpoint. When Li reached the red traffic light, he turned around and came back down the street on the east-to-west lane. A neighborhood worker named Lai jumped over the barrier in the middle of the street and attempted to stop Li. But Li did not stop. Lai used the walkie-talkie in his hand to hit Li in the head. Li's motorcycle spun out of control, and both Li and the motorcycle ran up against the light pole by the roadside. Li was severely injured and his unlicensed motorcycle was damaged. Afterwards, the Shiyan Street neighborhood affairs office workers called the police and sent Li to the hospital. At 12:30pm, Li Guochao was pronounced dead. The police said that there were no militia police officers at the checkpoint. The closest police presence was a militia traffic policeman who was about 300 meters away. However, the family of Li Guochao mistakenly believed that the checkpoint activity was conducted by the Shiyan Traffic Police Squad. At 13:00 or so, the family collected more than 30 persons to accompany them to go down to the office of Shiyan Traffic Police Squad. They demanded that the police tell them which militia police officers and neighborhood affairs office workers were responsible. They blocked the entrance of the Shiyan Traffic Police Squad office so that nobody could come or leave. 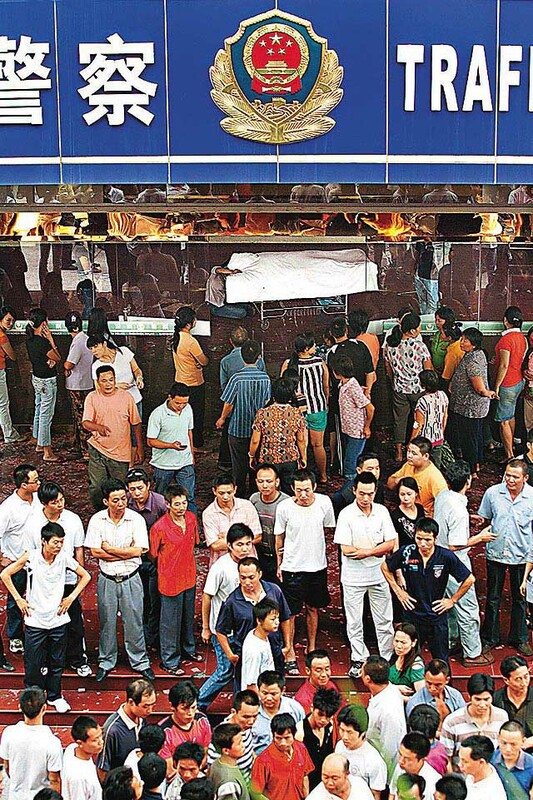 At 14:30, the family brought the body of the deceased to the Shiyan Traffic Police Squad office. 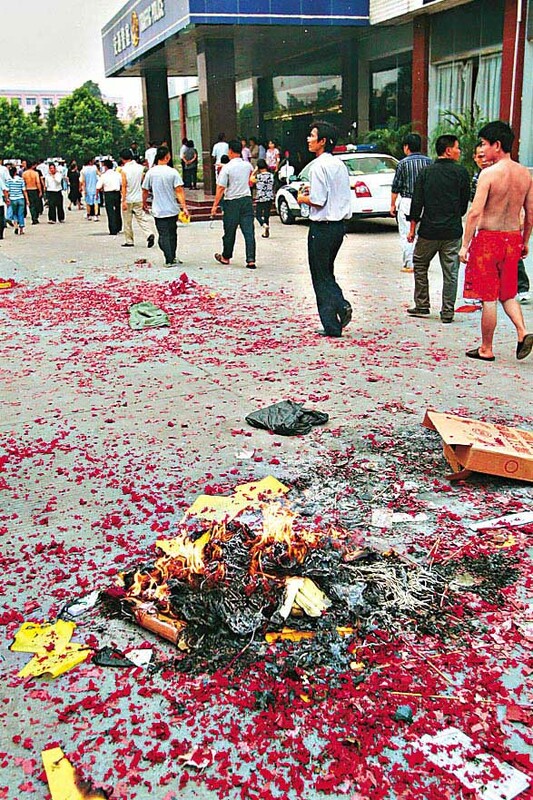 They smashed objects in the courtyard of the office building, and set off firecrackers. At 17:00, the number of persons in front of the Shiyan Traffic Police Squad building had gone up to more than 400 persons. There were also more than 2,000 spectators on the outside. Then a small number of criminal elements threw rocks and overturned police vehicles. 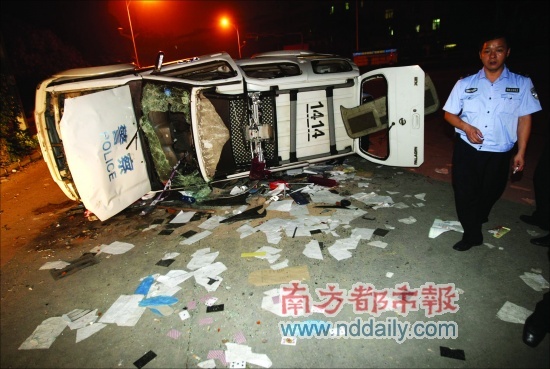 According to Shenzhen city public security bureau deputy director Shen Shaobao, the city and district government leaders paid a high degree of attention to this incident and went to the scene immediately. The public security bureau exercised a high degree of self-restraint and helped the relevant authorities calm down the situation. At this moment, the Shiyan neighborhood affairs office worker named Lai has been placed under criminal detention. The situation calmed down at 2am after the police issued the bulletin for the public. 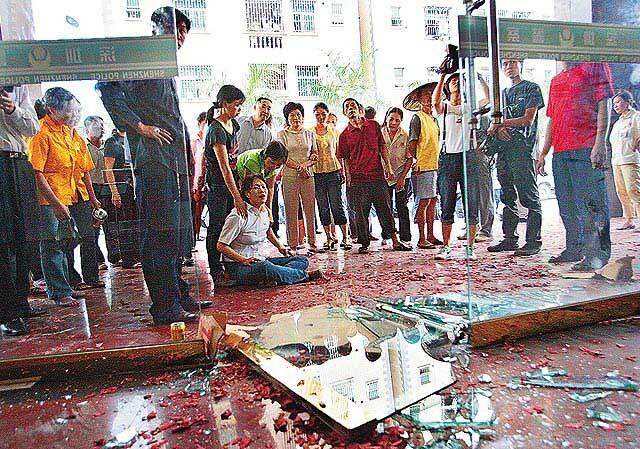 The family demanded compensation of more than 600,000 RMB. The Bao'an district government said that the compensation will be determined after the autopsy finds the cause of death and then the relevant regulations on compensation according to the circumstances will be applied. Meanwhile, the district government made an advance of 200,000 RMB and also guaranteed that the body of the deceased will not be handled without the consent of the family. Yesterday afternoon, the family of the deceased and their companions went to demand an explanation from the Shiyan Traffic Police Squad. At around 5pm, the traffic police as well as the anti-riot police reinforcements withdrew to outside the office building while the neighborhood affairs office, the traffic police and the representatives of the family of Li Guochao met to negotiate. By this time, half of the more than 400 people assembled there had left already. But in the evening, a lot of people came together again. According to a motorcycle cab driver who had been there earlier in the afternoon, a settlement did not come out of the negotiations. Therefore, they assembled again. This time, there were many more spectators. According to eyewitnesses, the Traffic Police Squad office building was surrounded by people after 9pm. Apart from the family posting a white paper saying "The traffic police blocked traffic and committed murder." Outside the Traffic Police Squad office building, an old man set up a long banner to accuse the traffic police of beating someone to death. According a militia policeman, things changed at just past 8pm. At the time, there was a large crowd on Baoshidong road and North Ring road. Some of these people were on motorcycles. Most of them were unidentified persons. According to an eyewitness, someone became to vandalize the police vehicles around 11pm. At the intersection with Wanluan road, a police vehicle was set on fire." "They chased after anybody wearing a uniform. They used bricks to hit them." A militia policeman present at the scene said that the police did not stay in their cars. A number of militia police officers were injured. According to a factory security guard, neither public security bureau workers or private security guards dared to go into the crowd, because those people threw rocks at and assaulted anyone in uniform. "Many of our security guards were chased and had to hide in the small streets." This security guard said that he saw what was happening and therefore he went back to his dormitory and changed into street clothes. The security guard said that seven police vehicles were vandalized, with one being set on fire. At 1am, a large number of police officers and soldiers were brought in and the crowd dissipated. (Zaobao) Opinion essay by Chang Ping. In Shenzhen's Bao'an district, there was a mass incident between the afternoon of November 7 and the early hours of November 8 in which the police were attacked. 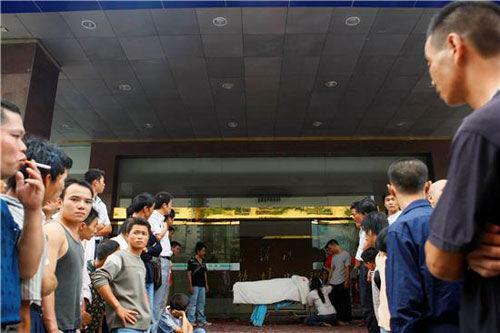 More than 2,000 people assembled outside the Shiyan Traffic Police Office in Bao'an district, and protested with a corpse in tow. 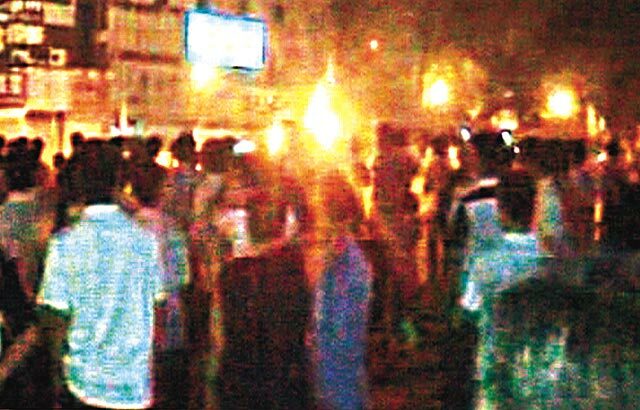 They smashed objects and set off firecrackers during an evening of disturbance. Afterwards, the Shenzhen police report did not contain the commonly seen term "the masses which did not know the truth." On November 3, there was a strike by taxi drivers in Chongqing city. On that day, the Chongqing city government said that "a small number of people manipulated this citywide taxi driver strike." "Manipulated by a small number of people" is a saying that we are well familiar with. But on the next day, the Chongqing city government discarded that positioning, and said that they will strike at "those criminal elements who are trying to stop the normal operation of the city." These two incidents are not connected, but I believe that the fact that the omission of the two standard clichés about mass incidents is a good thing that deserves attention. According to the Xinhua agency report, there were indeed "masses who did not understand the truth" in the November 7 incident in Shenzhen. On the morning of November 7, the motorcyclist Li Guochao was intercepted by the Shiyan Street neighborhood affairs office traffic inspector named Lai and tried to escape. Lai used the walkie-talkie in his hand to hit the head of Li Guochao, causing Li to fall off his motorcycle and subsequently die from his injuries. The family of Li Guochao mistakenly thought that the Shiyan Traffic Police Squad was responsible for the inspection, and therefore called together more than 30 persons to head to the Traffic Police Squad office. A large number of spectators were also drawn to the scene. It was then that I found out that neighborhood affairs office workers could inspect cars. But I believe that most citizens will be just like me in thinking that when someone enforces traffic laws in the street and even uses a walkie-talkie to kill the driver, that person must be from the traffic police. It was based upon this piece of commonsense that the family of the deceased went down to the Shiyan Traffic Police Squad office to demand an explanation. This is not a total failure to understand the truth. When there is an incident during the course of enforcement of traffic laws, it becomes the responsibility of the traffic police to provide an explanation as well as handle the matter. As for the spectators, even if the family of the deceased had gone to the right place, they may still not know the truth unless the relevant government departments offer an explanation in a timely manner. Under democratic politics, the first thing to solve a problem is to let "the masses who do not know the truth" learn the truth. In a democratic society, when the masses do not understand the truth, then some government official should be held accountable instead of despising the people for being so ignorant. "The masses do not know the truth" cannot be the excuse for government officials to shirk responsibility after a mass incident has occurred. The eyes of the masses are not naturally born "snow-crystal clear" but they should not be covered with dust either. To claim that they don't understand the truth ignores their right to know the truth. So many people are blockading the government offices only because they want to know the truth. The government departments control important social resources. Therefore, they have the responsibility to disclose the truth in a timely, accurate and complete manner. By law, China has the <Regulationis on transparent government information>. If there are things about which the masses do not know the truth, the relevant government officials bear the corresponding legal responsibility. I believe that many officials are gradually realizing this principle. They know that those clichés sound silly and are illegal as well. They are trying to find better ways to handle mass incidents. After the lesson of the Weng'an incident, a similar incident involving the death of a secondary school student took place last month in Dejiang city, Guizhou province. The Dejiang county public security bureau did not simply resort to violence to disperse the "masses who did not know the truth." They went to the scene and patiently explained and assuaged the crowd. They invited the principals to go to the police station to explain what happened. They used a slide show, written texts and oral narration to clarify the incident and controlled the situation. As a result, the Dejiang public security bureau received 10,000 RMB as a reward for its actions. Many netizens thought that they should not receive a reward for merely doing what they were supposed to. But I think that when public authorities perform their duties well, they deserve some encouragement.